If you've spent any time in a mall, you've surely noticed the occasional cluster of walkers, primarily women, dressed in sweatsuits and sneakers, panting their way around the place. They're mall walkers-- people who get their exercise at the mall, often before the place opens for business. And they're the basis of a Rochester based artist's sound collages. Minnesota Public Radio's Annie Baxter has more. Rochester, Minn. — Musician and sound artist Viv Corringham loves to walk. Back in England, where she's from, walking is considered a virtuous activity. "A walk is all about nature, communing with nature- communing with your higher feelings," Corringham says. It's all part of the romantic poets history that's passed down to us." Corringham tapped into this idea in a sound art project she called "Shadow Walks." She went around England and Ireland asking people to show her walks that were meaningful to them. She'd record her conversation with the person during the walk. Then she'd go back and take the walk alone. She would try to get a sense of the place and then sing what she felt--doing wordless vocal improvisations. In her final sound pieces, she'd mix the narration and singing together with recordings of the sounds of the place. Corringham says it was easy to find lots of walkers in England and Ireland. But then her husband got a job at the Mayo Clinic. She recently found herself living in Rochester. Corringham wanted to continue the "shadow walks" project. "There was this feeling that it was a very unreal, very sterile, very corporate world. So I was wanting to try and get this unreal style of singing into it." "And I quickly realized it wasn't going to be possible. Because you don't see people walking about in the streets in the same way. So I thought instead of trying to impose what I know onto this place, why not find out what it has. Where are people walking? And it quickly came to my attention that where they're walking is in the mall," Corringham explains. So Corringham headed over to the Apache Mall in Rochester. And she found people would get there at 7 a.m. and do laps around the place. "They go round and round and round, like a hamster in a cage. It struck me as a very odd thing to do," she says with a laugh. Corringham wanted to learn more about what makes these 'mall walkers' tick. So she asked a woman named Robin to let her tape their conversation during a morning mall walk. When Corringham went back to the mall alone, she then tried to capture the activity of mallwalking and the overall atmosphere of the mall's shops in her manner of singing-- and through texts she read aloud. "There was this feeling that it was very unreal, very sterile, very corporate world. It's their lighting. Their music that plays-- this very bland music all the time. It creates this odd unreality," Corringham notes. "So I was wanting to try and get this unreal style of singing into it. So I was doing this kind of high, wafty kind of singing." Corringham thought this impersonal sterile tone would dominate her final piece. But in the end, she says she was surprised by how much of the personal history of her mallwalker guide, Robin, came through. "There had been pains and little tragedies. But she was a very positive thinking person. It all came across as a kind of everything's fine attitude that was really touching actually-- really very nice," she says. 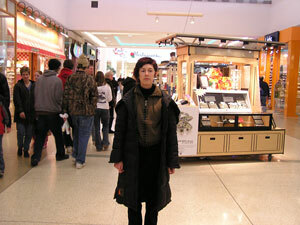 Corringham says she hopes to continue her project of shadowing mallwalkers... The Mall of America could be her next target.